This is inconvenience food at its finest. The lovely Sharon pointed out that the potato sack was empty and she had plans to cook and freeze an epic amount of food for the little lady. I ventured out into the turning weather and dug out some potatoes obediently. Then I turned my attention to the apples. The first autumn front was beginning to flex and stretch itself, simply waking up and preparing at its own pace. 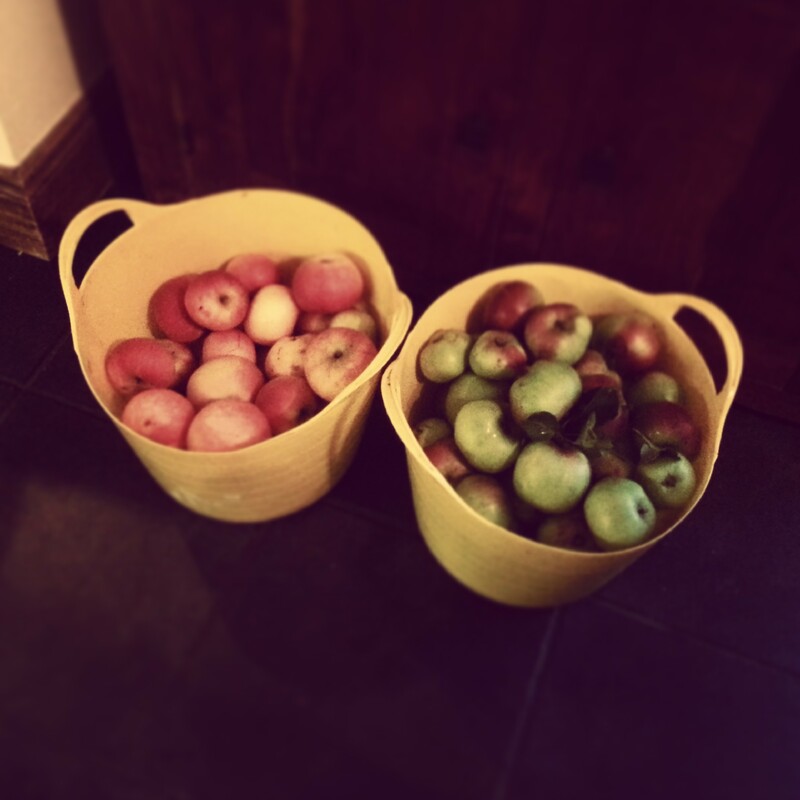 This wind loosened a few apples; that told me it was time. I picked and plucked, then several times stopped to watch the rooks above my head. It was undeniable, they were playing in the wind. 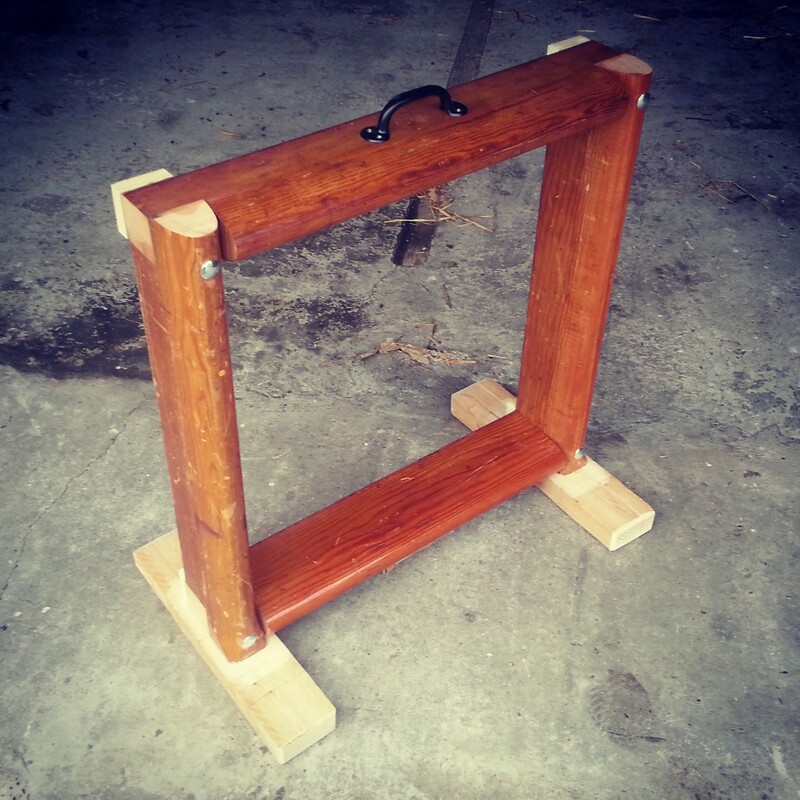 Then there was the apple press. This wood was part of the monkey bars in an old school gym before it was levelled to the ground. The whole school was folded into the earth and is now the mantle for a 3G pitch. These monkey bars sat gathering dust for a decade before they found themselves with me and the apples. Cutting, glueing, drilling and bolting the press was taken care of by a colleague for the modest price of a jar of honey, a bottle of single malt, and the promise of one bottle of cider no matter how it turns out. I was getting ready for the pressing when the in-laws and the out-laws all arrived. The cottage turned into a homely throb of the noise of children playing and the smell of various cooking projects on the go. The men folk gathered around the magnetic apple press like iron filings. 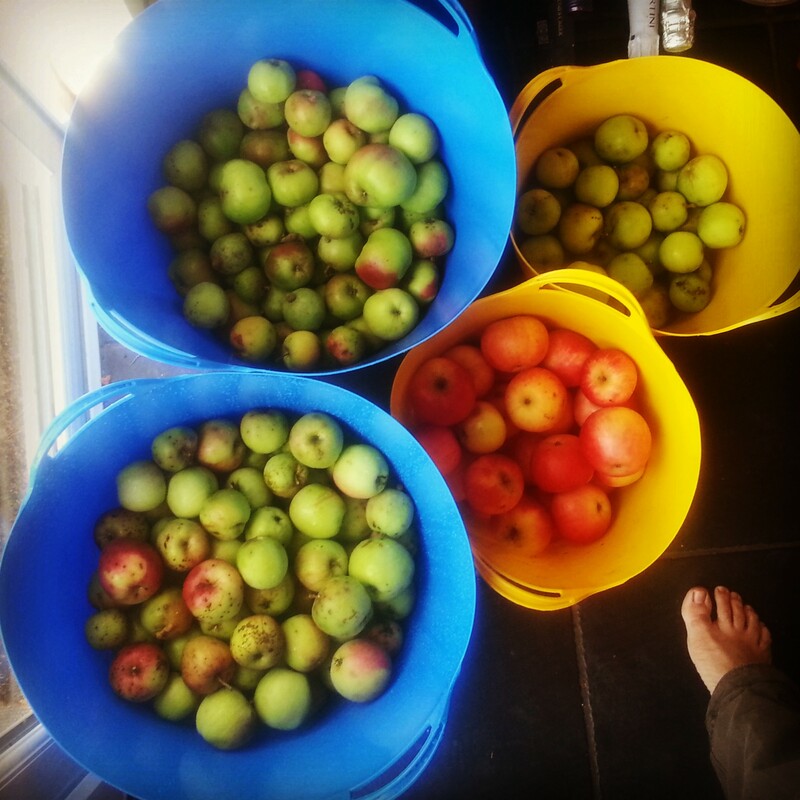 It should have been a case of too many cooks spoiling the cider, but actually turned out to be quite efficient. We all chopped apples speedily. I even swapped out my brother in law’s apples for rosemary at one point and he just accepted it and kept chopping (the foccacia needed to be finished and put in the oven). We found a thick tree branch and stripped the bark to use as a makeshift pulper. Then we pressed (sorry) the car jack and bucket into action. We were all quite surprised at how much juice came out. We pulped and pressed and then pulped and pressed again. After all the visitors had left the little man and I finished off enough pressing to fill the first demijohn, then we called it quits. 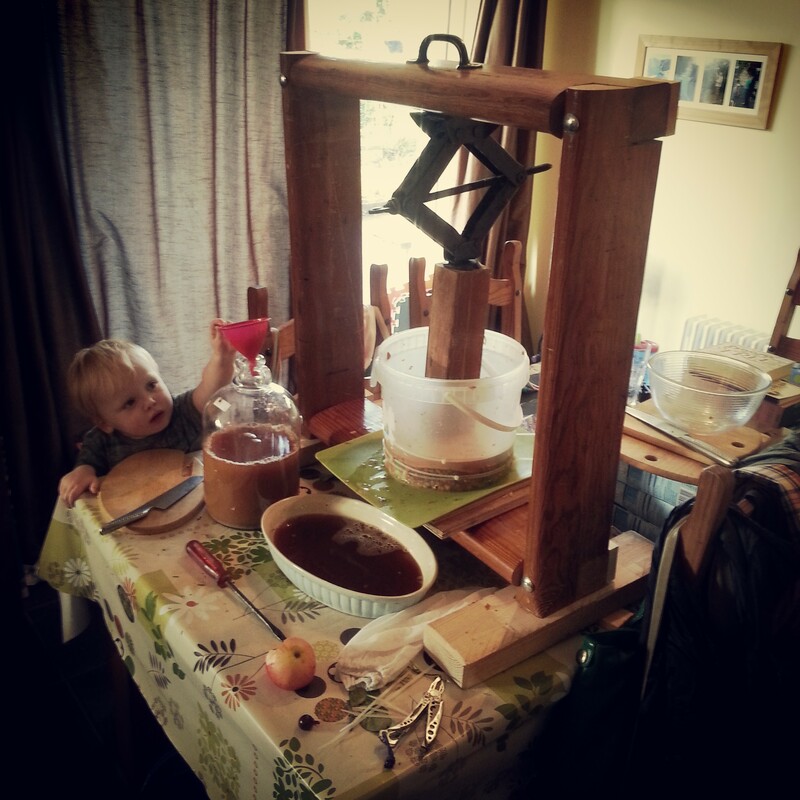 There are still buckets of apples to be pressed, but there should be plenty of more windy autumn nights to press them. I thought I was different? So there I was standing at the checkout of a discount food shop. The queue was long and it shuffled along slowly. Directly in front of me was an older couple. The man neatly placed a some coffee, tea bags, biscuits, and then a single bag of sugar at the checkout. The plastic divider* was placed just after the man’s modest shopping and the place was set for me to place my bag of sugar, then another, then another, then another, then another, then another, then another, then another, then another, then another, then another, then another, then another, then another, then another. I have always wondered what people think when they see me buy so much sugar, maybe thinking I am making a ridiculous amount of jam? Until now, no-one has ever voiced their thoughts. The man looked at my sugar and then looked at me, “Are you feeding bees?” Caught a little off guard I simply replied, “yes.” He nodded knowingly and admitted he was feeding his at the moment too. We briefly shared our winter/summer news regarding our hives, and then the moment was over as quickly as it began. We, two beekeepers, simply moved along and carried on as if buying insane amounts of sugar was perfectly normal. *As a side note I should say that I have been trying for years to buy one of these plastic dividers, but the checkout staff keep putting them back. A scene has repeated itself for the last couple of weeks now. As long as it is not raining we arrive home from work and unfold the blankets under the apple trees. Then we unfold the little man and the little lady onto the blankets complete with cushions and toys. After a while the little man loses interest in his toys and simply uses me as a makeshift climbing frame. From this garden encampment we pull out fistfulls of potatoes to peel for dinner. Then we graze the last of the wilting pea plants for the few remaining pods that were too small for the main harvest. They are still good when boiled but have lost their straight-from-the-pod sweetness that their brothers and sisters had, being locked away in bags in the frigid depths of the freezer now. Tonight an early autumn chill was in the air, but we had no choice. The little man dragged the blankets and cushions into the garden declaring; “picnic in the garden; let’s go!” The lovely Sharon, the little lady and I all wrapped ourselves in fleeces and cardigans and followed skeptically. We tried to make him wear his jumper but he refused. He did humour me by happily letting be put on his shoes. Then he happily removed them again and went boldly bare foot into the garden chuckling to himself triumphantly. For those who know me, you will know I am not a good influence in the area of appropriate footwear (or any footwear at all). As we peeled and podded in on the grass the little man helped and the little lady dribbled and tried to eat everything within reach: toys, cushions, pea pods, and even her own feet. Then a familiarity hit me; this is how we lived. For tens of thousands of years we have sat as families and prepared our food outside sitting on the earth, and it feels good.